The roof of your house protects what may be your biggest investment – your home. Not only do you take pride in your property, your roof protects your family, your pets, your belongings, even your favorite car. The good thing is, most roofs do their work quietly and without incident for years, even decades. But, even the toughest of roofs will eventually need some TLC. How long your roof lasts is partly related to what kind of roof you have. But the most important factor is the quality of the roofing installation. The best and most durable roofing materials in the world will still fail if installed incorrectly. Roof work done by untrained roofers may cause more damage than it repairs, and can be a very expensive lesson for consumers to learn. But, remember, no matter how sturdy the roof material you choose may be, your roof will only be as good as your roof installation. Mistakes like miscalculating the proper slope of the roof that controls the effect of rain runoff, for example, can lead to costly repairs. Unqualified roofers may not secure flashing correctly, or not nail the roof components in the proper places, allowing tiles to loosen or fall off in wind. They may fail to provide correct ventilation, leading to moisture retention under the roof that weakens your roof over time and can damage your home. Misaligning tiles or incorrect shingle overhang are common mistake of do-it-yourself-ers and amateur roofers and allow the roof to fail in wind, rain, ice or snow events. Basically, proper roof installation is a meticulous process that must be done correctly from start to finish so that your roof is able to carry out its main job – protect your home from damage – for a very long time. Only a trained, professional roofer can provide the skill and quality processes that are needed to do this job correctly. It’s a small investment up front to save you potentially many thousands of dollars of damage and repairs down the road. Quality roofing requires the right materials, parts and tools to do the job right. 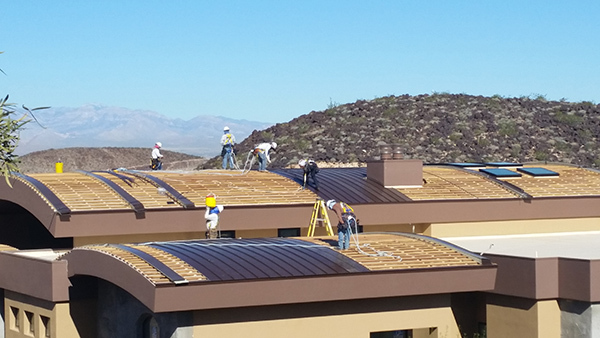 Prestige Roofing has been providing residential roofing services in the Las Vegas area for more than two decades. We’ve developed a network of relationships with quality materials and parts suppliers and manufacturers. They provide us with the best roofing materials like sparkling copper panels, CeDur shakes and tiles in a broad range of materials, styles and colors, including reclaimed, naturally-aged and refurbished European ceramic tiles. Although an injury, error or accident is less likely to occur when a professional residential roofer is performing an inspection and/or repairs, a professional roofer maintains insurance coverage to protect themselves, their employees, and you and your home and property. A good residential roofer carries adequate insurance coverage so that any claims that do happen will be resolved fairly, quickly and professionally. Always ask your roofer for proof of insurance to avoid what can become a costly mistake if something does go wrong. Professional roofing companies invest in worker safety training, such as OSHA safety classes, and provide proper safety equipment to all workers to protect them from slips, falls or other accidents. When workers are aware of proper safety techniques, such as positioning and attaching themselves correctly to your roof and trained in proper tool use, the possibility of accidental damage and injury is greatly reduced. Even if you have homeowner’s insurance, avoid unnecessary worker injuries on your property by hiring professional roofers who have received safety training. Tile roofing is the standard in Southern Nevada. It stands up well to the hot summer sun of the Southwest. Correctly installed, it will last many decades. 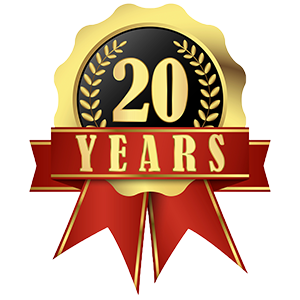 Prestige Roofing’s commercial and residential tile roofers are certified by the Tile Roofing Institute (TRI). They have met the requirements set forth by TRI so that we know that every tile roof installation or repair we do is done correctly and to the highest standards. Your professional residential roofer can provide regular inspections or perform minor repairs, such as after heavy rains, snow or wind, that can save you thousands of dollars. He is trained to look for minor issues such as loose or broken tiles, clogged rain gutters, loose flashing or other issues that, left unattended, can allow moisture, mold and rot that can cause expensive damage over time. Trust a professional roofer to care for your roof and you will be able to extend its life and save money in the long term. Sometimes, particularly after a big local weather event, amateur residential roofers flock to the area offering homeowners cheap roof repairs. While these offers may sound good, keep in mind that scammers abound and inexperienced roofing contractors from outside the area may not provide quality materials and professional work. Fly-by-night residential roofers are less likely to offer you a warranty, and may not be licensed or have adequate insurance coverage. Select a roofer who has a good track record in your community. These roofers will stand behind their work and do the job right. Besides providing you with peace of mind, replacing your home’s old roof can substantially increase its value. If you plan to put your home on the market, you may want to consider hiring a professional residential roofer to replace your aging roof. Even if you are staying put, enjoy the beauty and security of a new roof, or keep your current roof in good condition with regular care by a professional residential roofer. 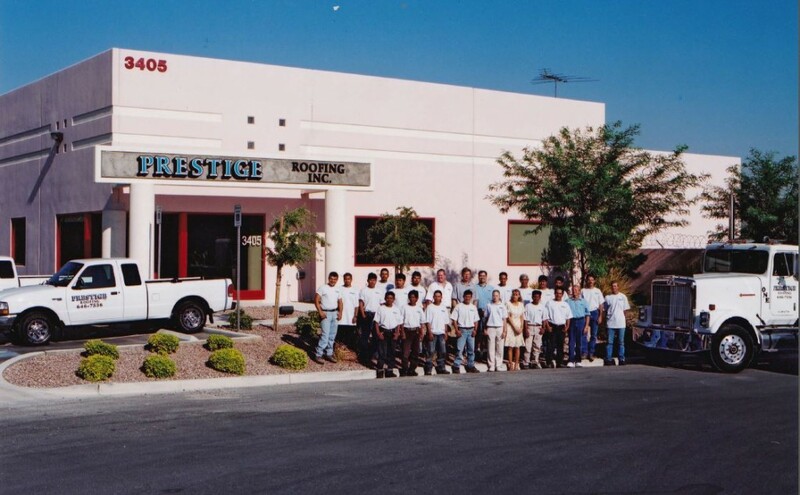 Give Prestige Roofing in Las Vegas a call if you have any questions about your roof or for a free inspection and estimate for your roofing project.